• Rotary also participated in (a very wet) Take-A-Vet Fishing event this Fall, cooking food for veterans who spent the day fishing at Killam’s Point, part of a program run by the Branford Congregational Church. • Veterans were also the focus in November as the Rotary hosted its annual Nelson Bernabucci Veterans Luncheon. More than 60 veterans, spanning 75 years of U.S. military service, attended the event, where they told stories, shared laughs, and were serenaded by the Branford High School Music Makers chorus. 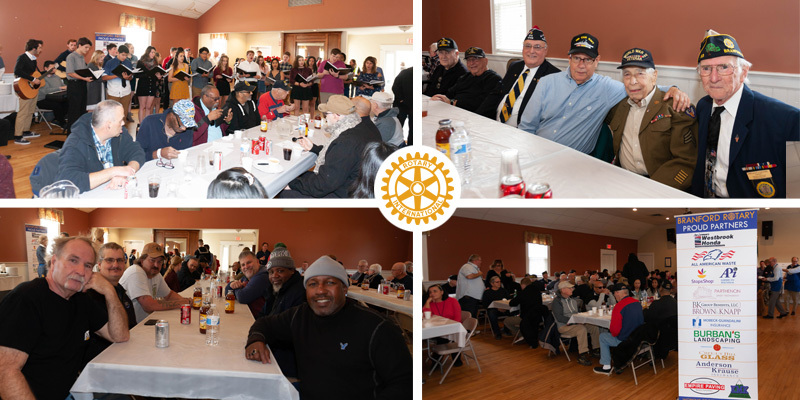 The luncheon welcomed special guests from the VA’s Eastern Blind Rehabilitation Center, as well as members of the American Legion and VFW. • In late November, Rotary, along with the Soundview YMCA, hosted the annual Thanksgiving 5k and Fun Run. More than 600 runners braved an unusually cold morning to take part. • In December, Branford Rotary hosted our annual Holiday Dinner, feeding 175 seniors, who dined on turkey and ham, mashed potatoes and gravy, and much more. Each guest also received a holiday gift, and sang along with Christmas carols by the Branford High School Music Makers chorus. • In addition, throughout the autumn - with the money collected from our dedicated members, through fundraisers and via our Rotary Partners - Rotary was able to provide financial support to several worthy organizations, including the Branford Food Pantry, Orchard House Senior Day Care, the Community Dining Room, and the Branford Counseling Center. As we head into Spring, we look forward to working at our annual ‘Feed Our Neighbors’ event, where we will package thousands of meals for those in need. If all of this sounds like the kind of organization you would like to be a part of, please contact the Branford Rotary at info@BranfordRotary.org, or click HERE to learn more about joining one of the world’s largest service organizations.